Herein is offered to you, the Uncompromising and Impassioned Seeker of Ancient and Contemporary Sacred Paths. Here are the things of Magi, Wizard, Sorcerer, Gnostic, Chaos Magick Priest, Alchemist, VooDoo Priest, Scholars and Witches et al -this is your venue to both common and rare items. Among these Magickal -Alchemical items are Grimoires, Books of Shadows, Herbs and Herbals, Books of Paganism and Christendom, Books of The Dead, and Ritual Magick of the Occidental and Oriental, from Today and Epochs past, are the Celebrated as well as Obscure Secret Societies, Masters of Corruption, Healers, Testaments in Books of Symbolism, Mystery Schools, The Role Call of Angels and Demons, Folklore, and the Foretold, The Divine and the Defiled, The Creators as well "those" who's hunger will never be satisfied. 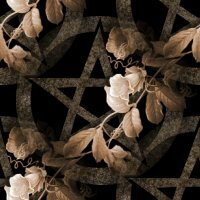 Ritual � Magickal items of all types for the many wondrous Sacred Paths. Some are �vintage� or �seasoned� by past Magickal Workings of previous Magickal Owners; others pure and awaiting their first consecration unto their future Workings. Precious Metals and Gemstones to adorn the Seeker or embellish a Sacred Altar and add Magickal Energy to Workings. Athame - Boline and Wands of Metals, Woods and Organics; Herbs, Incense and Resins in Sacred Blends to Honor the Deities; Candles for workings of the Sacred Fire; Cloaks and Robes to wear to Honor the Ancestors, The Shining Ones, The Noble Ones, The Old Ones � Divinity in all emanations. And much more. This is Magick and the Lost Technologies - the hidden knowledge and manifestation - within your reach and all around you - should you participate in it or not - most importantly - the power of your Faith and where you place it. Updated 08/22/09 Spell & Shadow Working Services Events! Get the The Wild Hunt Blog: A modern Pagan perspective. widget and many other great free widgets at Widgetbox! All products on this site are sold as novelty items only. Widdershin�s holds no liability or responsibility for the use or misuse of any product or information sold or read on this site. Herbs and oils are NOT intended for ingestion. We cannot guarantee the results of any magickal workings. Remember the magick lies within you and you alone. Must be 18 or older to purchase products. By purchasing any product or item from Widdershin�s you are agreeing to these terms. If you do not agree to these terms, please exit the site. DISCLAIMER: It is not our purpose to convert anyone to any belief or religion. We do not conspire to 'sell' beliefs and we do not 'recruit' for 'cults'. We attribute adults with the intelligence to decide what is best for themselves and we provide them with the knowledge and information to make an educated choice free from bigotry and cultural prejudice. This produces more responsible and aware citizens who can contribute more ably to the society in which they live. We exist to offer a genuine point of access to the Hidden Knowledge which exists behind the myriad beliefs which have underpinned the development of humankind so that genuine seekers can find their place in the scheme of things, identify the meaning of life and use magical methodology to improve it. Please Note: It is a rule of this establishment that we do not supply goods to people under the age of 18 unless their parents or guardians have given their permission in writing. Click here for our full policy on minors.